A few last months I noticed that dividend growth investors are selling their stocks and they say it is because of valuation. This post was inspired by them and the latest post by my friend Ferdis publishing at his blog DivGro and his latest post. The argument goes that the stock market is too high, valuation of the dividend stocks is also too high and by trimming or selling their positions they will be able to buy back later for a lot better price. Maybe they will be able to do so. Maybe the market will crash in the next few months and they will be able to buy back at a better price. But this means that you have to go into a business of predicting the market. And predicting the market is a fools game. When I started investing into dividend stocks and trading options I believed that I needed a strategy which would help me to predict the market or stocks move and potential trend reversals. I wanted that miraculous trading software, system, or strategy which would predict the trend reversal and I would always, or almost always, be on the right side of the market. I hoped I would be always trading with the trend and spot any reversal on time. Or end of a bull market or bear market respectively. The longer I am in the market the more I am convinced that you will never be able to correctly and consistently predict the market or end of the trend no matter how much you are going to rationalize your predictions. If we cannot predict the market correctly how do you know then that your stocks will go down and you may be able to buy cheaper later? By predicting the market you are setting yourself up for a big disappointment. You spend a lot of time calculating your fair value, predicting future sales, revenue, expectations, or goals of the company management. You are even going to defy and ignore political pressure which is strong these days and drive this market higher just to build your bearish case. 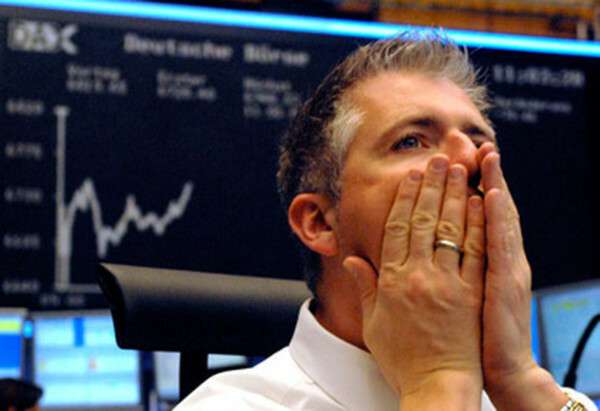 Yet, when your expectation goes bust, you will be disappointed or even angry at the market that it didn’t do what you expected, or FED that it rigged this market, or high frequency trading which ruined your gains, or other traders who over-reacted or who traded at unreasonable euphoria and greed. Everybody will be at fault but you just because you were foolishly setting up your expectations without knowing all variables of the market out there which can change the game at a dime. Just look at the latest Brexit event. When the market tanked the first day after the vote, bears were congratulating themselves for the perfect timing of the drop they have been predicting for weeks. Five days later the market was where it has been before Brexit and bears were shocked in unbelief blaming central banks for stepping in. But otherwise, if it wasn’t for the central bankers the market would for sure crashed. What fools! Unfulfilled expectations and disappointment are a huge emotional blow to your mind which will impact your future confidence. Do you really want to do that? Besides the psychological and emotional damage you are defying the entire purpose of investing into dividend stocks. What is the rule or premise of dividend investing? Why did you choose dividend investing in the first place? Did you choose dividend investing for trading the stocks? Because what you are doing now is trading. I picked dividend investing because I didn’t have to trade those stocks. If I was investing into growth stocks or wanted to be a swing trader (which at some point I wanted to be but failed), trimming of the gains and relocating them to different stocks or better opportunities would have its merit. Dividend stocks are not in that category. You do not trade the dividend stock because of valuation. In fact, I do not care what the valuation of dividend stocks is after I purchase them. Yes, prior to my initial purchase I try to see if I can buy cheaper or what the fair value is, but once I buy, I leave it. I do not care what the valuation is. If the stock is going down, I am buying more shares, if the stock is going up I am buying fewer shares. But I am not selling because the stocks went up. Not the dividend stocks and not in my dividend growth portfolio. I learned my lesson on this the hard way. The chart indicates that investors are mostly in bearish mood close to panic. Historically this has been a bullish sign and markets rallied. When you compare this to the sentiment on other websites tracking investors’ sentiment you will find the same results of investors being extremely bearish. A couple of years ago I bought shares of Johnson & Johnson (JNJ) stock when it was trading at $58 a share. When the stock moved to $78 a share I decided to trim my position expecting that when the stock falls back down to ~60-ish level I will buy back in. It never happened. The stock now trades at $122.80 a share. I regret I ever sold my JNJ shares. Realty Income (O) is another stock I purchased when it was trading at $37 a share. When the stock moved to $52 a share I sold because Realty Income was so overvalued that it was obvious that it would have to go down. Well, yes it went down to $47 a share. But I never bought back because I expected this stock to go lower. Investors were talking about buying Realty income when it gets below $40. And I foolishly agreed with them. The stock never reached $40. Today, it is trading at $69.91 a share. Why selling your winners which are making you money just because you think it is maybe overvalued so it must go down? And even if it does go down, how low would it go? When? And how do you recognize whether a decline is a beginning of something more dramatic or just a breather before the next move up? If the Realty Income stock drops by 20% on Monday, it would only fall to $55 a share! The stock would have to fall by whopping 47% in order to get to the same price I bought originally. And yet this wouldn’t justify selling this golden goose. If the stock drops by 47% I would still keep my original shares, and buy more even if I had to borrow money to do that. It took me years to build my portfolio and build my yield on cost and I would ruing it by selling? No way! · When do you really sell? When I started with dividend investing in 2006 the first thing I learned was to pick a good, high quality dividend growth stock, buy it, and never sell. The only reason to sell would be if the company doesn’t rise the dividend, cuts it, or suspends it whatsoever. This would be the only prediction I would agree to do: will the dividend be suspended, cut, or is it in danger? If yes, then maybe sell your stock or buy puts as a protection, just in case. · Is valuation a reason for selling? As I said above I consider valuation important only when buying the stock and opening an initial position. Adding to the stock then can be tricky, but I do not cry over a growing stock. It is good when it is growing, so why bother selling it? I like to be sitting on a large gain built over years. I do not need the money. But selling because it went up? I gave you two examples when by doing so I lost great opportunity. The dividend stocks will always tend to be overvalued. Realty Income (O) for example is a stock which will always trade overvalued. Waiting for it to drop to its fair value you will never buy. Or you might be able to buy only when the market crashes like it happened in 2008. But waiting for such crash may take another five or more years. And yet many investors, even the dividend ones, do not buy because they are scared and run to safety by selling the rest of their positions to preserve cash. 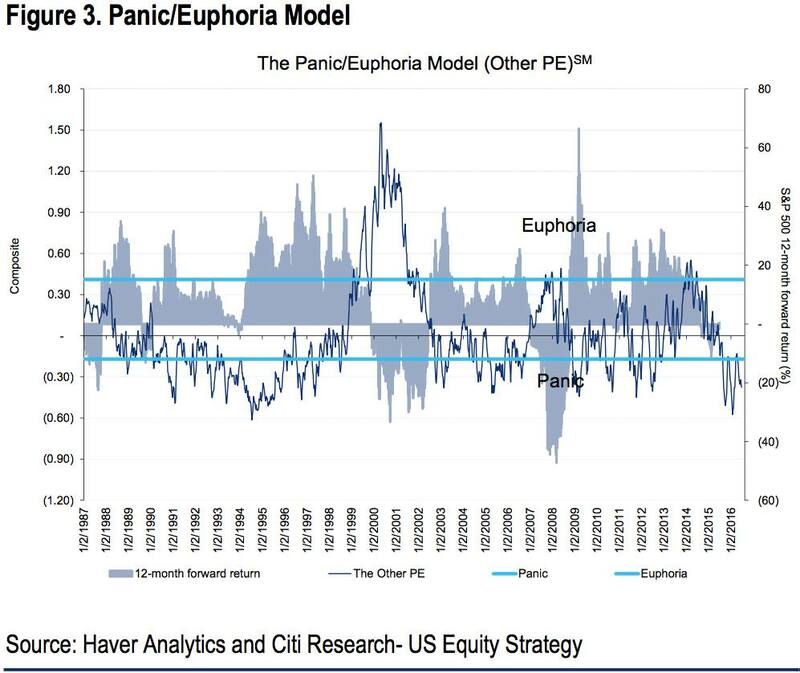 So now you are selling because the stock is overvalued and when the valuation crashes you are scared to death to buy and never get in or too late. If you are investing following this pattern you are dooming yourself to mediocre results never beating the market. Don’t believe me? Then pull out old data from 2008 – 2009 and study them. It happened. And I must admit it happened to me too! I too was scared to be buying in the beginning of 2009 because I refused to believe that the market really reversed. And still I was nervous in 2015 and 2016 when the markets dropped. But fortunately already educated enough not to panic and start selling. At least I had my DRIPping on and reinvesting all my dividends. Today? I would never sell just because the stock went up. And I would buy more than usual if it goes down. That’s why I am creating my sub-account named “a great opportunity fund” where I place a couple of thousands of dollars which I won’t use to buy shares on a regular basis but only if any of my stocks crashes and I can buy more than usual. Many times on this blog I said that I do not care what the value of my stock or entire portfolio is as long as my dividend income is intact. Many stocks in my portfolio actually grew and increased their dividends during selloffs and crashes. JNJ increased dividends twice during 2008 and 2009 when everybody was freaking and selling (from 0.41 to 0.46 in 2008 and 0.46 to 0.49 in 2009). Of course, I ended up holding a few bags of crap in my portfolio (mostly energy stocks, and prior to them mREITs) which cut their dividends and I didn’t respond to it. But, nobody is perfect, right? Selling stocks in your portfolio may have its purpose based on in which phase of your portfolio you are. Are you in an accumulation phase? Or are you a few years prior to retirement? If I have more than 20 years until retirement selling stocks in my portfolio because the S&P 500 is at 2129 value and that is too high is laughable. What is too high? When S&P 500 was at 100 in 1969 people thought this couldn’t go higher. 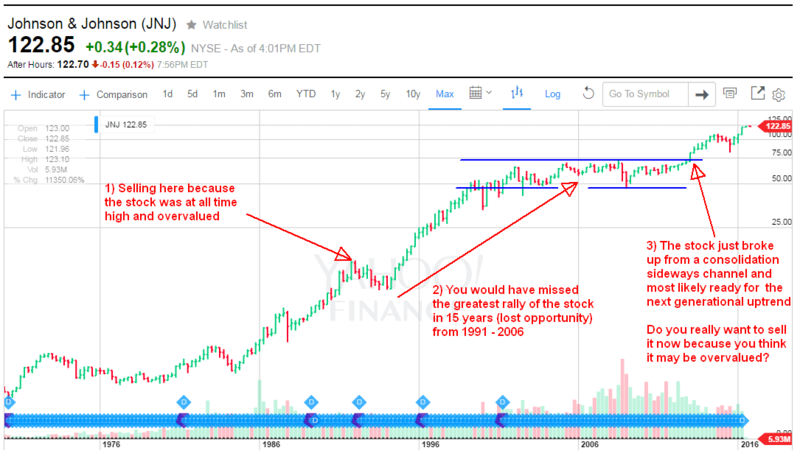 When we stalled under 500 during 1993 – 1994 people thought “this is it” we are at all time highs, the market is overvalued. It traded just below 500 for two years before it finally jumped over 500 level and moved higher. And same happened when we approached 1500 level. Yes we had two major corrections at that level. It took 10 years before we were finally able to move higher, but today we are higher than we were in 2008. And if you were in this game in 2008 as I was, did you predict correctly the market’s crash? And its recovery? I wasn’t able to do that. The best approach was to stay through, reinvest the dividends, and eventually buy more shares. I had my ROTH IRA and my 401k accounts riding them through 2007 – 2009 (until today). In my ROTH IRA I was paralyzed by the events. I tried to trim some of my positions to protect my portfolio and failed to buy back in disbelief of a recovery. The result? A loss. I sold low and bought high. In my 401k I continued investing a portion of my salary (with the employer match) and reinvesting all proceeds. The result? I quadrupled my account (it went from $15k to $73k). Because my ROTH IRA was an experiment to prove that a self directed retirement account investing into individual stocks is better than a mutual fund based 401k I contributed the same amount of money to both accounts to have same starting conditions. Yet, thanks to consistency and sticking to the plan, 401k beat me. ROTH lost money. This lesson contributed to my final realization, that my dividend investing is like a mutual fund. Consistently invest, reinvest, and never sell. Since then My ROTH kicked in and it is speeding up surprisingly well. And in the next 20 years, the S&P 500 might be at 6000 value (not a prediction, just a number for the sake of an example), so why freaking today that 2129 is too high? I personally feel there are always deals in the stock market, if you search around enough. We can quote history all we want, but the truth is the last 20 years in the market have been completely different than the last 100 years. The ups and downs in the market have been huge, in both a yearly, monthly, weekly and daily basis. You need to be vigilant with your holdings. Exiting the market completely? I agree, not a good move. But dumping positions when they get way outside your reasonable price range? That’s just smart tactics. Sold my Target position at $82 a few months ago and was able to get back in at $67 just a month later. That is potentially 6 years worth of dividends! However, truth be told, we all have our own methods of investing and will all have to deal with the results of our decisions accordingly. Good to hear another person’s perspective, even though it doesn’t fully align with mine. Man, I am so torn on this topic…. I get what both of you (Martin and Keith) are saying here and it makes complete sense. Then I take a look at the gains of a few of my stocks and see gains that anyone would appreciate. The itch to “lock in” those gains are really tempting. I think what has kept me from selling anything so far is the point that DGI methodology is to build a portfolio of passive income. So whether the stock is up or down, if the dividend is safe, then why would I sell? Thanks for the counterpoint about this topic though! Adam, that\’s the point of dividend investing. You are not investing for capital gains (from which you will have to pay huge taxes if you have it in a taxable account) but for dividend income. Any capital gain on top of it is a cherry on top of the cake. When I sold 1/2 of my JNJ position at $78 I also thought I was \”locking\” in a profit, but instead I was locking myself in a \”lost opportunity\”. Now the stock is trading at $122 a share and I could only participate with half of the position in this growth. Those sold shares could never make me any penny on top of what I could have made. Yes if you are a trader, swing trader, it makes sense locking in profits but dividend investing is not swing trading. So you choose what you want to do – trading or dividend investing. Over a 20 year or 30 year period, your stocks will be a lot higher than today, believe me, the dividend stocks tend to grow at the same ratio as their dividends. They are slow in the growth, but they do. So if the dividend grows by 5% a year, the stock will also grow approx. 5% a year. If you sell them now because of valuation, 20 years from now those shares will be 4 times higher but you will miss that growth. And you will miss the years of dividends which would never be paid to you. If your stocks are good, high quality dividend stocks, there is no need selling them. A very timely post as I was noticing the same thing among several of our fellow DGI bloggers. Since I started reading these blogs about three years ago a “recent sell” post was very rare if almost nonexistent. These days, I’m reading more and more about selling out totally, trimming positions and raising cash for the valuation reasons you stated above. In fact, I have been reading some sells at a loss from some high quality companies. There’s nothing wrong with selling. Nothing wrong with being a trader, but I agree, that calling yourself a dividend growth investor, when the primary reason is for us to create an ever growing passive income stream and then selling out trying to time and find better buying opportunities makes you a regular trader and not a long term dividend growth investor. Keith, you said that perfectly! As a dividend investor, I am not a trader. Period. And if I bought a stock at $30 a share and it now after years of holding it trades at $120 a share then selling it just because it may be overvalued is a big big nonsense. The stock will never drop from 120 back to 30 so you can buy back in. And even if it does, then I will just buy more shares while still holding my original position. Thanks for saying this because I started thinking I was the only one seeing it this way!